If females can reproduce by themselves, why are there males? In both nematode species we are working with, there exists a "choice" between self-reproduction and out-crossing. In S. papillosus parasitic females can either produce parasitic offspring that reproduce parthenogenetically or they can give rise to a sexually reproducing free-living generations. Figure 1: Decline of the proportion of males in laboratory cultures of different strains of C. elegans over time. In C. elegans, the two sexes are hermaphrodites and males. Hermaphrodites can either reproduce by virtue of self-fertilization or they can mate with a male and use the male derived sperm to fertilize their eggs. While virtually the entire progeny that is produced by self-fertilization is hermaphroditic, half of the cross-progeny is male. We and many others have noticed that males disappear from laboratory cultures of some wild isolates of C. elegans while they persist in others (Fig. 1). In collaboration with Hinrich Schulenburg at the University of Kiel, we address the questions what might cause these differences in male maintenance and under what circumstances out-crossing or self-fertilization might be favored. Wegewitz, V., Schulenburg, H. and Streit, A. (2009). Do males facilitate the spread of novel phenotypes within populations of the androdioecious nematode Caenorhabditis elegans. Journal of Nematology 41, 247-254. Wegewitz, V., Schulenburg, H. and Streit, A. (2008). 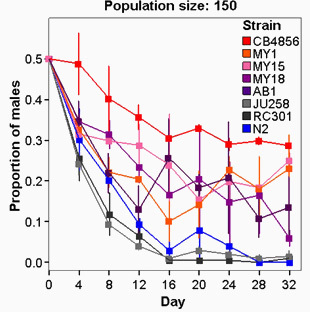 Experimental insight into the proximate causes of male persistence variation among two strains of the androdioeciousCaenorhabditis elegans (Nematoda). BMC Ecology 8, 12.